We all know it. The rows of houses, neatly stacked bricks, manicured front lawns and community mailboxes. This describes the neighbourhood where most Windsorites live and grew up. However, when did this become the status quo? How did we get here, and is it really the best housing idea society has come up with? 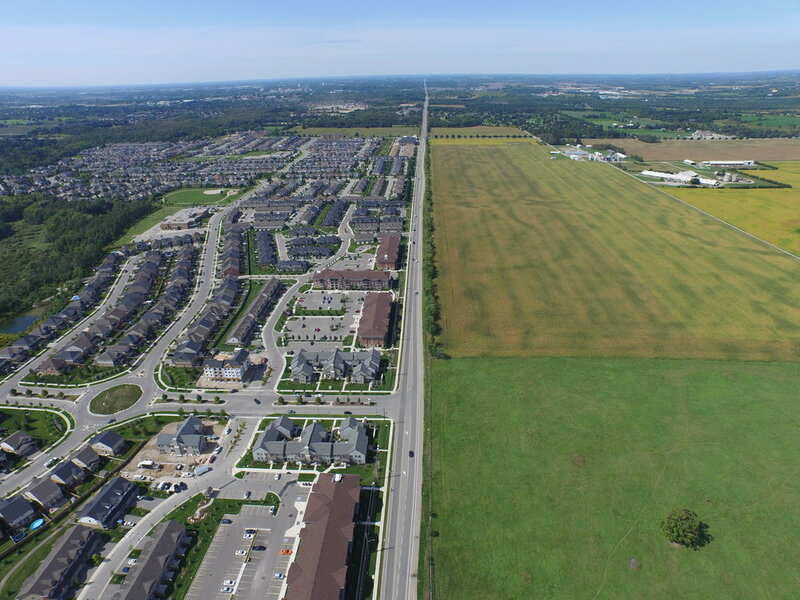 A driving force in the spread of suburban life has been (predictably) simple economics: land is worth much more to a developer than it is to a farmer. Farmland can be purchased in bulk for $6000-9000 per acre, but once part of a new “development”, it can be prized at $80,000-160,000. This enormous profit motivates developers to buy up land as fast as consumer demand for new houses can meet it. Here they are - 4 seriously good reasons to reconsider life in the ’burbs. Number One: Suburbs are a terrible use of land. Every time you buy or build a brand new house in a new development, you are contributing to one of the least efficient uses of land in human history. As the human population grows, we have to learn make things more compact. Subdivisions do the polar opposite. Suburban growth is primarily responsible for city growth, also known as “urban sprawl". From 1970-2000, over 200,000 acres were consumed by urban sprawl (that’s the equivalent of Windsor’s downtown core every single day). In the new millennium, things haven’t slowed down. The Ontario Greenbelt Alliance reports that another 260,000 acres (1,070 km2) of rural land will be developed, mainly into suburbs, by 2021. This is double the size of the entire Greater Toronto Area. This level of expansion is unprecedented and absolutely unsustainable; there simply isn’t enough land to house everyone this way (especially as the population continues to increase). Number Two: Subdivisions chip away at Canada’s Agricultural Economy. The Ontario Greenbelt Alliance also reports that 92% of new developments happen on agricultural land. Worse still, Southern Ontario is home to the only Class 1 farmland in the country. Repeat: the most productive agricultural land in Canada (per acre) is being swapped for driveways and backyards at the rate of thousands of acres per year. Sure, Ontario’s big, but it is not infinite. Each further encroachment on rural territory is land that can never again be used for agriculture, and the remaining space is being cut back every year. Number Three: Subdivisions are terrible for the environment. Worse still: as farms get paved over, the agricultural industry must expand into new territory. And, unfortunately, there is only one type of available land left: natural areas. Forests end up destroyed to make way for new farms to replace those lost to urban sprawl. In simple terms, the model goes like this: cities get bigger, causing farmers to seek new space, and they invariably cut into unprotected natural areas. This happens year in and year out, and this can’t continue. A lot of the world's last pristine forest land is being lost, and much of it is in Canada. Additionally, spreading everything out is really inefficient. For example, your local “convenience” store is now a five-minute drive rather than a five-minute walk away. This creates a living environment wherein if you don’t have a car, it’s very difficult to get to the places you need to. Thus, everyone has a car and everyone is driving all the time, which contributes to pollution and global climate change. Detached housing is also less efficient to heat than attached housing, which contributes to additional and unnecessary energy usage. Number Four: Living in a subdivision can cause an unhealthy & unhappy lifestyle. The Ontario Greenbelt Alliance quotes a study that has found a “clear link between obesity, chronic disease, and urban sprawl. People who live in spread-out, car-dependent neighbourhoods are likely to walk less, weigh more, and suffer from high blood pressure, compared to people who live in less sprawling areas.” There is plenty of material on the psychological effect of suburban living, too; the detached housing and complete lack of community can lead to acute social isolation, and an abundance of correlated mental health issues. Think about it: if you live in a subdivision, how many of your neighbours do you know? Okay, got it. Bad for the environment, inefficient use of land, bad for farming, bad for my health, got it. So, what’s the solution? The solution is easier and more accessible than you might think. The best possible option is to take advantage of the limitless real estate of the sky: that is, consider living in an apartment building, or if you prefer to buy, get a unit in a condominium complex. This can save you time and money ( you have no grass to cut and you’re not responsible for maintaining the property), and it can offer you plenty of neighbours with whom you can create a community. On the macro scale, rezoning old spaces and remodeling underutilized buildings into living complexes is ideal. This exciting urban renewal practice can create entirely new neighbourhoods within inner-cities. Petaluma Avenue Homes, a sustainable co-housing development in Sebastopol, California. Even easier is a not-so-new idea from the Nordic countries called Co-Housing, wherein several or many families live together, each having their own private quarters but sharing things like a kitchen and living space, and splitting up the housework between everyone. So, start small - but think big. There are better, more eco- and human-friendly ways of housing in developed countries. We just have to put our heads together and rethink the suburban status quo.